Big Walnut’s Tyler Ronk (7) sprints down the sideline during the first half of Friday’s OCC showdown against visiting New Albany. 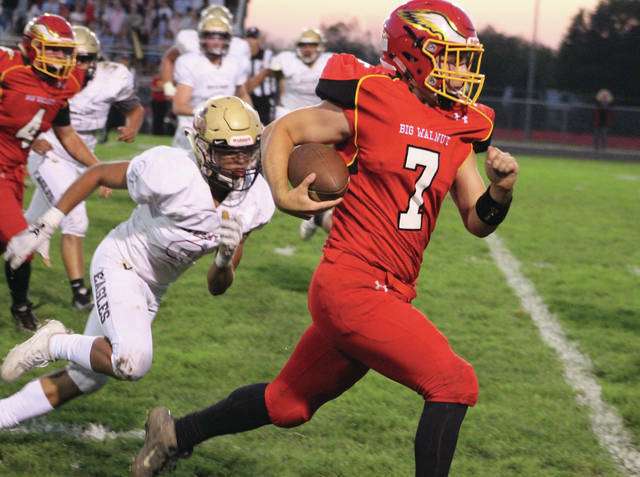 The Big Walnut football team picked a good time to get on a roll, winning each of its first three OCC-Capital Division contests after dropping all five of its non-league showdowns. The most recent came Friday night in Sunbury, where the Golden Eagles (3-5, 3-0) used a dominant defensive effort to notch a 14-0 win over visiting New Albany (4-4, 2-1). The win puts Big Walnut alone in first place with two games to go — next week’s roadie against Groveport and the season finale Oct. 27 against visiting Canal Winchester. Neither team was able to get much going early on. Turnovers and a missed field goal kept the game scoreless until the Golden Eagles’ Nathan Lawyer found the end zone from two yards out with 33 seconds left in the first half. Tyler Shuster tacked on the extra point to make it a 7-0 game at the break. Lawyer doubled the Big Walnut advantage with another two-yard touchdown run with 6:27 to play in the third quarter, smoothing out the scoring summary. The Cardinals made things interesting late in the game, but the Pacers did more than enough late in the first half to notch their first league win of the season Friday night in Delaware. Hayes’ Mason Davis had a key interception and Glenn Pauley had a stellar sequence that included back-to-back sacks to keep the game scoreless through the first quarter and a half. Thomas Worthington (3-5, 0-5) finally broke the scoring seal with a 37-yard field goal with 3:11 left in the second, but Hayes (3-5, 1-3) responded with 21 unanswered points to take control by halftime. All three touchdowns came within the final 40 seconds of the half. After the Pacers scored to take a 7-3 lead with 38 seconds left, the Cardinals muffed the ensuing kickoff and Chris Johnson recovered at the Thomas 12-yard line. Quarterback Blake Eiland scrambled for a 12-yard touchdown run on the very next play to make it 14-3. The third TD came with three seconds left in the second as Josiah Naegele returned an interception to the house from 47 yards out. They were the only 21 points Hayes scored all night — all in a span of 38 seconds — but, as it turned out, they were the only points the Pacers would need. Thomas scored a touchdown late in the third and pulled a little closer with a TD on the first play of the fourth quarter, but the Hayes defense stood tall from there. Grant Owens passed for 230 yards and a pair of touchdowns and Trent Davies added 197 yards and two TDs on the ground to lead the Barons to a wild MOAC win over the visiting Presidents Friday night in Delaware. The game couldn’t have been much closer, with the teams trading touchdowns throughout. Down 21-20 at halftime and 27-20 early in the third, Buckeye Valley (5-3, 3-2) evened things up with an 82-yard touchdown pass from Owens to Tanner Hogg with 4:33 left in the third. Harding regained the momentum with a pick six two minutes later, but missed the extra point as the back-and-fourth battle continued. The Barons went up 34-33 when Davies scored from 19 yards out and Felipe Scharff added the ensuing PAT with 11:55 left in the fourth. A 51-yard scoring strike helped the Presidents (5-3, 3-2) regain the lead, 39-33, but Owens hit Hogg from two-yards out with 3:49 left in the fourth quarter to account for the final margin. It was Buckeye Valley’s last home game of the season, with the win improving the Barons to a perfect 5-0 in front of their home fans this fall. https://www.delgazette.com/wp-content/uploads/sites/40/2017/10/web1_ronk.jpgBig Walnut’s Tyler Ronk (7) sprints down the sideline during the first half of Friday’s OCC showdown against visiting New Albany.